The Martin J. Whitman School of Management at Syracuse University was originally founded in 1919 as the College of Business Administration, earning an Association to Advance Collegiate Schools of Business (AACSB) accreditation in 1920—just the 16th business school, at the time, to do so. Less than 30 years later, in 1948, the business school launched its first official MBA program. In 1977, the school launched its one-of-a-kind long-distance MBA. 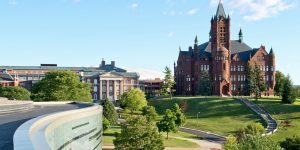 Third Avenue Funds founder and Syracuse College of Business alum Martin Whitman (’49) and his wife Lois Whitman donated $23 million to the business school. In honor of the donation, the Syracuse renamed its business school as the Martin J. Whitman School of Management. The Martin J. Whitman School of Management is located in the heart of Syracuse University’s North Zone, near the center of Syracuse, New York. The university also provides adjacent learning centers in New York City, Washington DC, and Los Angeles. The Whitman School of Management is located less than 10 miles south of the Syracuse Hancock International Airport. Whitman’s main building is a 160,000 square foot center built in 2005. The facility features many environmentally-friends features, and includes a cafe, 22 classrooms, group meeting rooms, and an auditorium. Whitman also houses the Ballentine Investment Institute, geared toward preparing students for working on Wall Street, the Kuhn Real Estate Center, which offers training programs for real estate professionals, and the Falcone Center, home to the Entrepreneurship and Emerging Enterprises department. The The Martin J. Whitman School of Management employs nearly 100 faculty members for its graduate, undergraduate, and Ph.D. programs, with specialties in: accounting, entrepreneurship, finance, management, marketing, retail, and supply chain management. There are more than 2,000 undergraduate and graduate students enrolled in the Whitman School of Management. Approximately 1,800 of these students are enrolled in undergraduate programs, with the rest being spread out among the school’s various graduate programs. The Whitman School of Management MBA Class of 2018 entered the business school with average GMAT score of 623, an average undergraduate GPA of 3.44, and roughly 38 months (3.2 years) of professional work experience. The Whitman School of Management offers a full-time on-campus MBA, a full-time online MBA, a dual MBA/EMPA Defense Comptrollership program, and a dual B.S. in Engineering/MBA five-year program. In addition, the school provides multiple business Masters programs, such as the Master of Science in Professional Accounting, a Master of Science in Business Analytics, and a Master of Science in Entrepreneurship.